Why is the Nearshore Subwatershed Important to Salmon? The Puget Sound nearshore -- where land and marine waters meet -- is a dynamic and interdependent ribbon of life for many plants and creatures. Salmon depend on the marine nearshore for food and shelter. Their success here reflects onthe overall health of the nearshore ecosystem, which in turn is a key part of the greater Puget Sound environment. Important Information on Bulkheads and the Nearshore for Planners and Shoreline Property Owners. Planners and shoreline property owners should be aware of the latest information on the impact of bulkheads on the marine nearshore. A 10 minute video produced in September 2008 provides an overview. This video was produced by the WRIA 9 Forum of local governments with financial support from the King Conservation District and the Puget Sound Partnership. Watch the video on bulkheads and the nearshore (Windows Media file). The nearshore is the boundary between saltwater and land that stretches from beach bluffs out into the shallows of Puget Sound. This subwatershed also includes the small streams that drain directly into Puget Sound from West Point in Seattle south to Federal Way. 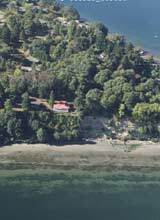 All of Vashon-Maury Island -- uplands, streams, and beaches and bluffs -- also is included. The map at right shows most of the Nearshore subwatershed (a small portion of nearshore in Federal Way is excluded). View a map showing this subwatershed in relation to the rest of the watershed. The nearshore  the boundary between saltwater and land that stretches from beach bluffs out into the shallows of Puget Sound  provides an important link in the life history of salmonids. All anadromous salmon -- those that live in both fresh and salt water in their lives -- use the nearshore to acclimate to saltwater, feed, seek refuge, and as a migration route to and from the ocean. Most salmonid species are dependent upon the nearshore for juvenile rearing. Much of the greater Puget Sound shoreline has been filled, armored, and developed. Extensive areas have been dredged to maintain navigation along piers and within marinas. The supply of beach sediment has been curtailed due to bulkheading. Upland land use practices have affected nearshore habitats. It is estimated that marine riparian (shoreline) vegetation exists along only 11% of the WRIA 9 watershed shoreline on the mainland. This loss of habitat affects not only salmon produced in the Green/Duwamish Rivers and other local stream but also those produced in other Puget Sound watersheds that use our shorelines for support during migration. Fish distribution maps show where anadromous salmon and trout have been found or should be present. These maps were created in 2000. Simplifying the remaining channel and severely reducing streamside ("riparian") functions such as shade and insect input. More recent water quality data are available at the King County marine and sediment monitoring page. See also water quality data from the Washington State Department of Ecology. Projects funded by the Salmon Recovery Funding Board and other grantors are listed here. The projects listed below are only a few of the various projects of governments and volunteer groups in this subwatershed. Information on the status of individual projects also is tracked on the state's Lead Entity Habitat Work Schedule. Follow the external links to learn more about these communities and what they are doing to improve habitat for salmon. The Puget Sound Partnership is the lead state agency for Puget Sound recovery. It provides a venue for people across Puget Sound to work together. Its mandate includes both marine nearshore areas as well as freshwater streams, rivers, and uplands. Begun in 2006, this is a partnership of People For Puget Sound, the Trust for Public Land, and the Nature Conservancy. Its goal is to create 10 new waterfront parks or natural areas, restore 100 miles of shoreline through on-the-ground restoration, and protect 1,000 miles of shoreline over the next ten years. The purpose of the Puget Sound Nearshore Ecosystem Restoration Project is to identify significant ecosystem problems in Washington State's Puget Sound Basin, evaluate potential solutions and restore and preserve critical nearshore habitat. The project is a cooperative effort among government organizations, tribes, industries and environmental organizations to preserve and restore the health of the Sound's nearshore. Since 1949, the KCD has been helping the people of King County manage their natural resources by educating landowners, schools groups, scientists, consultants and agencies in recognizing problem situations and avoiding the creation of them. KCD also provides technical assistance in solving problems. The Port of Seattle manages large areas of the waterfront on Elliott Bay and the Duwamish. The natural areas of these properties are managed to provide fish and wildlife habitat as well as public access to water. In addition, piers and other shoreline facilities are designed and operated to minimize harmful impacts to salmon and other aquatic resources. People for Puget Sound is a non-profit citizens group dedicated to educating and involving people in protecting and restoring the land and waters of Puget Sound and the Northwest Straits. It has done work on both the mainland and Vashon/Maury Island nearshore. Puget Soundkeeper Alliance was created in 1984 as a coalition of citizens and organizations concerned about the health of Puget Sound. This City of Seattle effort is a partnership with the community to protect and restore streams, lakes, and marine shorelines. Fauntleroy Creek in West Seattle is home to coho salmon. An active group of local citizens are protecting and restoring the creek. A Watershed Council was created in 2001 to help guide these efforts. This Seattle Public Utilities sponsored web site provides educational resources, information on events and projects, and other creek and community specific information. The environmental science center focuses on informing and educating the Highline community about aquatic and terrestrial ecology in Seahurst Park and the beyond. Educational programs are available for schools and members of the general public. The Cities of Burien, SeaTac, and Normandy Park; the Port of Seattle, and King County jointly fund stewardship of the Miller/Walker Creek basins in the Highline area. Members of the Normandy Park Community Club are restoring Miller/Walker Creek for the benefit of salmon and bird and wildlife. This City of Des Moines web site provides contact information for a group of concerned citizens devoted to stewardship of Des Moines Creek. The Science and Technology Center is located on the Redondo waterfront in Des Moines. It is the centerpiece for marine science programs at Highline Community College as well as an educational center for south county nearshore communities. In addition to classes, the center offers various educational programs and opportunities to observe and touch nearshore marine life. This City of Federal Way site provides information on joining a stream team for Joe's, Lakota, and other streams in the city. The page also includes information resources and contacts for city residents who want to protect water quality, stream habitat, and the Puget Sound nearshore. Greg Rabourn, 206-296-1923, is the King County basin steward for Vashon/Maury Island. Greg is available to work with property owners to help them steward their land and water. This website provides real-time data on marine water quality from two buoys moored in Quartermaster Harbor between Vashon and Maury Islands. Interested in watching for salmon on Vashon Island? Check out this page to learn more and volunteer. It is the mission of the Vashon-Maury Land Trust to conserve lands to protect the natural ecosystems and rural character of Vashon-Maury Island. The Land Trust has help preserve freshwater streams and nearshore habitat in cooperation with island landowners. The group promotes and deepens public awareness of nature and helps protect the ecology of Vashon-Maury Island. Series of graphics illustrating the nearshore environment, its processes, and problems affecting the nearshore due to development. Comprehensive information on salmon habitat as of 2000. Includes detailed information on on salmon populations, conditions in specific subwatersheds and stream basins, and maps showing salmon habitat. Comprehensive information on the nearshore ecosystem in the Green/Duwamish and Central Puget Sound Watershed as of 2001. Summary information of shoreline habitat conditions that affect habitat quality and quantity for juvenile salmonids. Also available upon request are Geographic Information System (GIS) layers with these data. Published March 2004. Information about how Chinook salmon use the nearshore and other parts of Seattle. Washington Trout (now known as Wild Fish Conservancy) completed stream typing surveys on Vashon/Maury Island in 2001 and the nearshore mainland in 2004. This City of Federal Way site has a map of Joe's Creek, Lakota Creek, and and other streams in the city. Detailed information and resources from King Countyon the streams and groundwater of Vashon-Maury Island. Information from King County on the marine nearshore, streams, and upland ecologies and management efforts on Vashon-Maury Island. Completed in 2004, this report is a comprehensive inventory of the island's surface water needs. It lists priority drainage and water quality projects, acquisitions, studies and programs that would all be funded over time by surface water management fees. Information on the first state aquatic reserve designated in Washington State by the Department of Natural Resources. Information about the Central Puget Sound watershed. Lots of great tips for people who live next to the beaches and bluffs of central Puget Sound. This Washington State Department of Ecology web page helps landowners and citizens learn about and protect the shorelines of Puget Sound. Aerial photos of Puget Sound shoreline as well as maps showing various geological and ecological features. Includes downloadable publications, maps, and water quality information for Green/Duwamish and Central Puget Sound Watershed (WRIA 9). Limited information is available for the nearshore portion of WRIA 9.